It wasn’t immediately obvious to me when I was purchasing but what you get is essentially a Google Hangouts add on with some front end marketing features. I was incorrectly expecting something more like GoToWebinar with unlimited attendees. 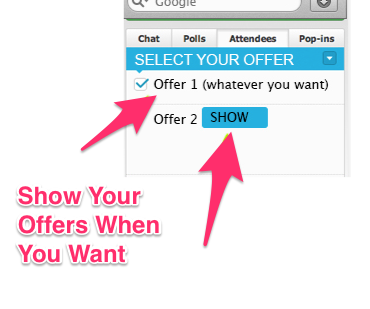 Honestly, I did think about cancelling my purchase a few times since this wasn’t going to replace GoToWebinar for me. But the more I played around with it, the more I realized how powerful it is. So if you’re thinking about purchasing WebinarJam, then you need to think about it as a platform to better utilize Google Hangouts. Otherwise, you might find yourself disappointed afterwards. If you’re already thinking about it this way, then let’s move on! Just to re-iterate my previous point, WebinarJam can be worthwhile if you want more out of Google’s very powerful Hangout app, or you want to at least try it out for your business. Now that we have that out of the way, let’s talk about how WebinarJam can help you. You can charge people to attend the presentation. You get to use some easy to use and fairly nice looking templates. Real time polls, surveys and public/private chat rooms. If you’re using Infusionsoft, you can easily register people using an HTTP post. All you’ll need to do is update the “yourname” so that it’s ~Contact.FirstName~ and “you@email.com” so that it’s ~Contact.Email~ and usually schedule will be “1” but you can leave that to whatever number it was originally and you can delete the countrycode and phonenumber parameters. Now the reason why this is useful to have is because if you’re driving registrations through OptimizePress or through Leadpages, you can’t register them directly with WebinarJam because none have native integrations with WebinarJam. So is WebinarJam for you? In many situations, I think that Google Hangouts will be enough or even Leadpages (in case you’re already using them) can do Google Hangouts hosting together with live chatting and product link. I know that some internet marketers including John Lee Dumas (of Entrepreneur on Fire) uses Leadpages to host Google Hangouts and then sells a $2,000 podcasting product. If you’re looking for more overall control of the webinar experience, more detailed analytics, and better conversions, then WebinarJam is seriously worth considering.